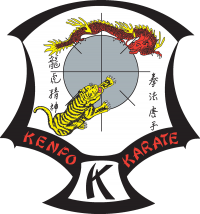 The primary purpose of the Jersey Kenpo Karate Association is to preserve, teach and perpetuate the art and lineage of Ed Parkers Kenpo system. We pledge a loyalty to continue these teachings through our 1st, 2nd and 3rd generation Black Belts. Up holding the vision and standards of Mr Parker’s organisation, the IKKA. The purpose and goals are ‘Master of ourselves’ towards a ‘Path of Excellance’ working through the ‘Master Keys’ of our instructors’ teachings. Mr. Maurice Mahon of Dublin formed the 1st Karate school in Jersey in 1978, when Mr. Mahon left he handed the reins to Mr. Don Cassidy also of Dublin Ireland. Mr. Cassidy left in 1974 leaving the reins to Mr. Roy Macdonald who still runs the Jersey School today. Graham Lelliot, Dave Williams and Jim Rennie were all tested for their Black Belts in the early 80’s by SGM Mr Ed Parker in Jersey. All were Roy Macdonald’s students and he is very proud of all 3 of his very first Black Belts. Since 1974 a total of 75 Black Belts have been tested through the Jersey Association: many here in Jersey and in many in other countries. Master Parker visited Jersey on many occasions having a particular fondness for the island. He came here a total of 19 times right up to the year of his death in 1990 when he was invited over to Jersey by Roy Macdonald. In about 1975 Rainer Schulte was invited over to Jersey, a Senior Black belt based in Germany. An American citizen, Rainer was very instrumental in the development of Jersey Kenpo, coming over to teach us until the early and middle 80’s. Through Roy’s and Rainer’s contacts in the USA many other American Black Belts came over to teach, e.g. Larry Tatum, Skip Hancock, Denis Conaster, Rick Hughes, Lee Wedlake and many more. All were very instrumental in the development of Jersey Kenpo. Chief Instructor Roy Macdonald continued to travel many times to the USA to train extensively with Mr Parker, Larry Tatum, Jim Mitchel and many other USA Instructors in Santa Monica and Pasadena; most of the time actually sleeping and staying in the Santa Monica Kenpo Studio this was also very instrumental in the development of Jersey Kenpo. 49 European, 3 IKC Long Beach USA and 12 World Champion titles.